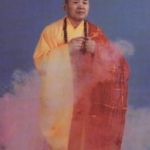 Shi De Qian was born in Dengfeng in Henan, China, at the foothill of the Shaolin Temple. His given name was Sun In Wong, and also named Evergreen. His birth name is Wang Chang Qing. He became a disciple of Shaolin as a child, were he learned Kung-Fu from Master Shaun-Shu Siashi. Also Shi De Qian learned the Chinese Martial Arts, Acupuncture, Chi-Kung bone treatment, and also excels in Lo-Han Chuan’s eighteen style, Hei-Hu Chuan, Yi-Jin Jing, and Chinese herbalist. In the last twenty years Shi De Qian has done an enormous amount of research on martial arts, and has searched over 17 Chinese states and South East countries collecting data. In 1992 Shi De Qian finished his two books: “Shao-Lin Wu-Shu Encyclopedia” and “The Secrets of Shao-Lin Healing”. To date Shi De Qian has written over 57 books on martial arts. Now considered a professor of martial arts Shi De Qian writes for the Kung Fu Society, and has been a guest speaker to the United States, Japan, Singapore, and New Zealand. Shi De Qian is also the 31st generation heir of the master. About Shi De Qian: He was in the Shaolin Temple when he was 15 age of years, and stayed there to be a Shaolin protection monk for 31 years, till 1992. He was the Abbot of the temple for several years until replaced with Shi Yongxin. Then He lived outside of the temple, as a Shaolin layman monk. Shaolin layman monks compare with the temple monks (who still live in the temple) the only different thing is that they can eat meat or drink beer, and other foods and beverages, but the rest about them is the same. So All Shaolin Temple monks who live in outside the temple are Shaolin layman monks too. They have a certificate, which issued by their Shifu from Shaolin Temple. Because we all trained some time in the Shaolin Temple in previous years and everybody is still permitted (and proud to say) they are Shaolin Temple Wu Seng (fighting monks, or protection monks). Shi De Qian sifu is very highest skills in the Shaolin Temple and he still writes many Shaolin Kung Fu books and his Shifu Shi Su Xi 30th generation and also himself just do not mean to let some highest secret Kung Fu lose for it not easy to get and they don’t want to see these secrets lost with the years going, as he did with recorder of Kung Fu forms not only for profit, but also in this meaning. Shi De Qian was the one who appointed Shifu Manuel Marquez as 32 generation Shaolin monk, and gave him his Buddhist name Shi Xeng Peng. 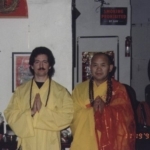 This happened in the Shaolin Temple in China in 1990 then he did the ceremonies again here in the USA this was done in Lomita’s school in 1996 when Shi De Qian taught the original Yi Jin Jing from the Shaolin Temple from China. Shi De Qian —Vice President, Henan Martial Arts Association: Secretary Chief, China Shaolin Chuan Research Center: President, China Shaolin Wushu University. Chief Shaolin/President China Academy Shaolin Arts. Shi De Qian is a classmate with Master Che Cheng Chiang of 31st Generation from the Shaolin Temple in China.